What's Stopping Us from Building Cities in Space? No, It's Not Tech. 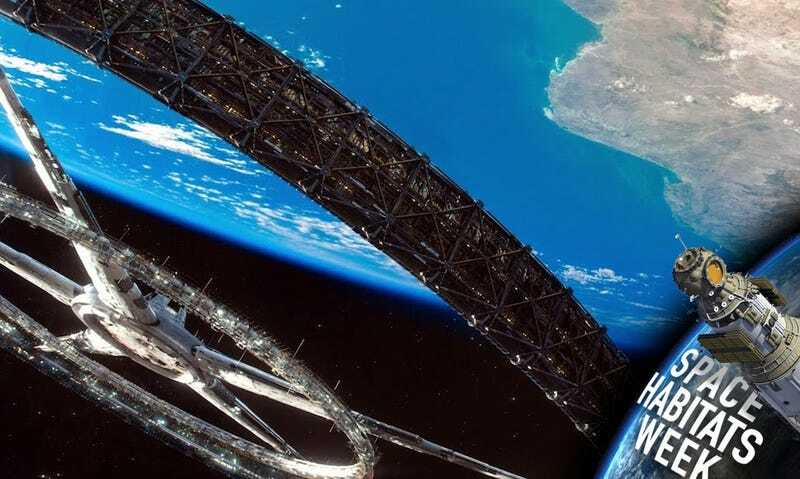 The US has a plan for Americans to live in space. In 2012, the National Research Council was commissioned by Congress to roadmap the future of human space exploration. Last June, the team published its findings in a massive report, which called for several action steps to be taken immediately. One year later, are we on track? One of the report’s authors was designer and Spacehack founder Ariel Waldman, who works on ways to make technical concepts around space colonization more accessible to the public. In 2008 Waldman took a job at NASA to coordinate its CoLab initiative, which allowed NASA scientists to collaborate with outside communities through open-source projects. The overall response to the report (which you can read in its entirety here) was good, says Waldman. “When the report came out, a lot of different parts surprisingly resonated well with Congress,” she told Gizmodo. In the year since, Waldman has witnessed some encouraging feedback—but also plenty of disheartening trends that are keeping the roadmap stalled. Of course there are plenty of tech advancements that need to be made to get humans living in space—gotta figure out that radiation protection!—but those challenges aren’t the biggest things holding the US back. There are much bigger political, perceptual, and yes, economic shifts that need to occur to get us thinking about living off-Earth. Statistically, China’s space program is a few decades behind the US, but consider these facts: In a span of ten years the country sent ten people into space. In 2013 they landed a rover on the Moon. The agency is currently working on a mission to Mars and a proposal for its own space station, which is planned for sometime in the 2020s. Soon, China will undoubtably surpass the US in its efforts for space colonization. Even more frustrating is the fact that certain politicians who are otherwise zealous about human spaceflight are voicing support for the China ban. Take Representative John Culberson, a Texas Republican who has been evangelistic about a mission to Europa. Since this Jupiter moon is thought to have liquid water and a climate which might support life, it’s currently second in priority in the roadmap, and NASA will soon need to make a critical decision about funding it. (Update: As of today, it’s moving forward.) But he has also been vocal about not working with the Chinese. Many other political figures point to China’s human rights violations as a reason not to align with the country. Yet they seem to overlook the many human rights concerns when it comes to collaborating with Russia. What could it take to change the US’s policy on going into space with China? A presidential order would help, but that doesn’t seem likely. What’s more plausible are some workarounds that may allow for indirect collaboration without bilateral cooperation. Our existing alliance with the ESA and Russian programs, which have been separately planning a Mars mission with China, might allow some American science to tag along somehow. But competition here is not the way forward. This isn’t a Cold War-era USSR-USA space race, this is all the world’s major space programs except ours working together. When the roadmap named a human landing on Mars as the first priority for space colonization, the internet got excited. But a lot of the reasoning for going to Mars has been hyperfocused on a single issue: We must find a place to live when Earth no longer lets us live here. Maybe we’ve all been watching too much Battlestar Galactica. But it’s not just pop culture. How many times have you heard Elon Musk talk about his dreams to live (and die) on Mars to “help ensure the survival of humanity”? Thanks to a few very strong voices like Musk, the argument to ensure the survival of the human race has become the most-repeated reason for going to Mars. But it’s not a very good one, says Waldman: It’s not evidence-based. We have no idea if living on Mars is feasible, let alone a place where we should be relocating our entire civilization. And that shouldn’t be the motivation behind investing billions of dollars and potentially sacrificing human lives. “There’s a lot of talk about why we’re going to Mars from the blogosphere, which is a really good thing,” says Waldman. “But no single rationale alone argues for a continuation of human spaceflight.” In fact, the report gives a long list of reasons, which the team was able to track across demographic groups. Of course certain reasons will resonate more with certain people, but the overall answer is more nuanced. Just saying that we need to decamp to Mars as part of some kind of Noah’s Ark scenario isn’t the best one. So much of what seems to motivate any space exploration is the concept of flag planting, which the US pretty much invented: I HEREBY CLAIM THIS MOON FOR AMERICA. Take away these imperialistic aspirations and the goals of human spaceflight become unmeshed with these ideas of nation-building—and a lot more pragmatic. What’s incredibly exciting right now is how many developing nations have access to space thanks to swiftly changing technology. It’s not just China’s speedy space timeline that’s an indicator of this. Five years ago India sent a mission to the Moon and now has a spacecraft orbiting Mars. This is not just a pursuit of the wealthy superpowers anymore. More than 70 countries now have space programs—the science that will get us to another solar system could come from any of them. Just like “saving humanity” is not a good reason to go to Mars, this is not a pursuit to “discover” another planet—and we’re not taking our geopolitical baggage with us. Scientists need to work towards including more voices in these efforts without countries getting all wrapped up in the possibility of laying first claim to Martian mining rights. One of the largest criticisms of the NASA budget that it currently is not adjusted to keep pace with inflation, which is the most often-reported challenge in getting Americans onto other planets. As the report outlined in a series of charts, if the budget is even slightly adjusted for inflation each year, a pathway to Mars becomes much more feasible and much less risky. In the past year, the Obama administration has championed a “re-energized space program” that has certainly achieved some notable milestones—like a test flight of the Mars-worthy Orion spacecraft and the development of the Space Launch System (SLS) to get it there, as well as several studies to see what happens to humans when they leave Earth for that long. Where the extra funding will come from in the next decade, though, is up to Congress. If the budget doesn’t increase, we’re not going anywhere. What about corporations like Space X or Virgin Galactic? Commercial ventures might help in the sense that private companies might finance the spacecrafts themselves, says Waldman, but the programs themselves still require funding—and vision. “You’re still talking about hundreds of billions across decades even if it takes zero dollars to build.” And who knows, even companies backed by Elon Musk and Richard Branson could go bankrupt. Other groups are trying to put numbers together to figure out how to get humans to Mars. Last month, Bill Nye presented a JPL-developed proposal for an orbital settlement around Mars at the Planetary Society’s Humans to Mars summit. Astronauts would leave in 2033 for a one-year stay in Martian orbit (the timing would coincide with the optimal Earth-Mars alignment every 26 months which makes the trip shortest), setting the stage for a landing mission in 2039 or later. Nye’s full report will be issued later this year, but a proposed budget claims that it can be done using the funds from the human exploration program at NASA (as long as it is adjusted for inflation), if NASA stops investing in the ISS (which is already planned in 2024). One problem with this plan, however, is that it assumes the US will be working independently, not collaborating with other nations, which, as Waldman and others keep pointing out, is really the only way to make sure the US can mount a properly financed, sustained effort to live in space. There’s one final plea from Waldman, which I found myself thinking about quite a bit after our conversation. Many Americans like to believe that the 1960s were some kind of heyday for human spaceflight—we look back at this period and bemoan the fact that the space program will never be as exciting again. This is not bad news, says Waldman, and I agree. It means that the actions taken in the very near future will be able to change the way people think about going to space. Whether or not we land a human on Mars in our lifetimes, this Golden Age of space exploration is still to come—once we’ve decided as a civilization that we’re committed to making it happen. Corrections: China sent 10 Chinese nationals into space within a span of ten years, I mistakenly wrote two years, and John Culberson is a Texas representative not a senator. The article has been updated.